Resting in peace: The coffin of Warrant Officer Kevin Conway (pictured) is carried to the burial site by Australian soldiers. KEVIN Conway, the first Australian soldier to die in combat in Vietnam, has at last been brought home and given a Catholic burial. 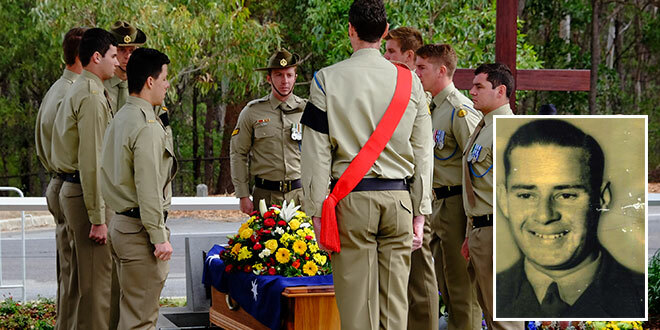 The remains of Warrant Officer Conway were among those of 35 Australian soldiers repatriated last month from various Asian burial sites. About 400 mourners joined Conway’s niece Kathy Woodford and family members Wayne, Julie and Len Strandquist to bury a favourite uncle at Cleveland Cemetery on June 6. 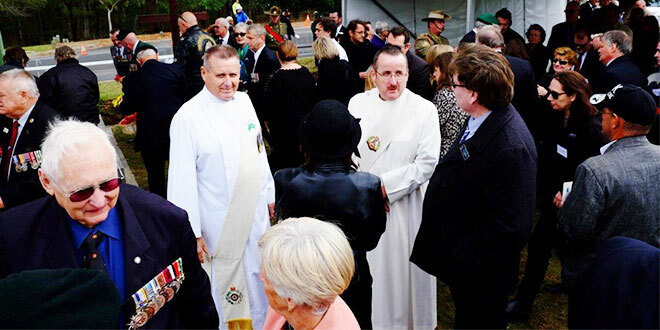 Army chaplain Deacon Peter Devenish-Meares presided over the historic burial, attended by official mourner Third Brigade commanding officer Brigadier Chris Field, Victoria Cross winner Keith Payne, Redland City Mayor Karen Williams and Australian Army Training Team Vietnam national president Col Kerry Gallagher, ret. Warrant Officer Conway, a former Wellington Point resident, died in battle in the early hours of July 6, 1964 – almost 52 years ago. He was the only Australian serviceman attached to a US Special Forces team at Camp McBride, Nam Dong, which was attacked by more than 700 Viet Cong. Recently retired army and police chaplain Deacon Graeme Ramsden, himself a Vietnam veteran, delivered a poignant homily, quoting from John 14:1-7. Laid to rest: Deacons Graeme Ramsden and Peter Devenish-Meares with mourners after Warrant Officer Kevin Conway’s burial. “This reading tells us that when Kevin died in that bunker over 50 years ago, he was not abandoned by God,” Deacon Ramsden said. “Our Catholic faith, and this Bible passage remind us that Jesus promised to come for him and take him to a special place prepared for him – a room in Jesus’ Father’s house. “Kevin chose his path, a path of service to our country and of assistance to any ally. “It cost him his life, but I believe it to be a worthy path.” Warrant Officer Conway enlisted with the Second Australian Imperial Force in 1947, serving with the first Australian War Crimes section in Hong Kong. He served in the Korean War and Malaya with the 1st Battalion, Royal Australian Regiment, before deploying to Vietnam in November 1963 with the AATTV. He was awarded the National Order of Vietnam, South Vietnam’s highest award, and the rare Campaign Service Medal with Clasp (South Vietnam), among other medals. He was recommended for the Victoria Cross, but this was not awarded because Australia was not officially at war at the time. The AATTV started a “bring them home’’ campaign and last year the Federal Government decided to offer to repatriate the remains of 35 soldiers from Terendak in Malaysia and Kranji in Singapore where they had been buried.